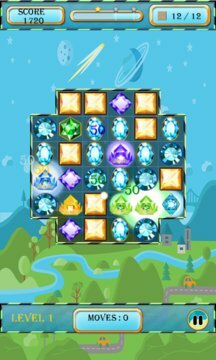 Match jewels on every square to destroy all the squares under the jewels. Then a magic candy will appear. Let the candy fall off the board to win. Sometimes, you have to free the jewels from chains or destroy walls to complete the level. On every level, you can get up to 3 stars. Next world unlocks, when you reach 160 stars in the previous world. 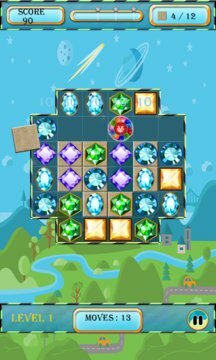 To make the game saga more fun, make matches of 4 or 5 to launch meteors, which will help you complete the level. Meteors will either crush the squares under the jewels, or the jewels under the candy to let the candy fall down.